LORETO, Mexico (Sept. 22, 2008) – The Villages of Loreto Bay, an 8,000-acre, seaside community neighboring the historic town of Loreto in Baja California Sur, Mexico, welcomes its newest addition to the neighborhood: Casita Cortez, a, two-bedroom, two-bathroom home by the sea including interior furnishings starting from US$375,000. Boasting 1,090 square feet of comfortable indoor and outdoor living space, the Casita Cortez homes are designed to fully complement the region’s distinct environment and enriched beauty, blending modern luxury with Spanish Colonial architecture, traditional Mexican décor and the relaxed comfort and tranquility of the sea. Large outdoor courtyards and an optional 360-degree viewing tower give way to luminous desert sunsets, stunning views of the Sea of Cortez and majestic panoramas of the Sierra de la Giganta mountains. Native desert plants garnish the terraces, while authentic Mexican tiles and simple, well-appointed finishes add to the warmth, charm and beauty that is Baja Sur. Loreto Bay, which was recently showcased on the Home and Garden Network’s (HGTV) popular spin-off series “House Hunters International,” offers several floor plans for buyers to choose from. The newest design, Casita Cortez, makes living the Loreto Bay lifestyle fully attainable, specifically for those seeking the perfect entry-level home at this exclusive resort community. Homeownership allows access to a membership providing a golf club, fitness and tennis facilities and special programming featuring kayaking, snorkeling and hiking. Plans also call for a beach club facility that will allow Loreto Bay to be among the best resorts currently available in all of Baja. For more news and information, visit www.loretobay.com. To access floor plans and high-resolution jpeg images, please visit the following link (available until October 3, 2008): https://rcpt.yousendit.com/607766340/23af38b8c86e8205d14513fd15310a42. Additional images available upon request. Loreto Bay is an 8,000-acre seaside community neighboring the historic town of Loreto in Baja California Sur, Mexico. The Loreto Bay community includes the 155-room Inn at Loreto Bay hotel with on-site fitness center and spa services, three restaurants, swim-up pool bar, 24-hour concierge services and golf, and plans for 6,000 authentic Baja-style homes, mixed-use buildings among pedestrian-friendly streets and nearly 1,500 acres of open space and a nature preserve. Visitors to Loreto Bay enjoy a wide range of outdoor activities such as kayaking, snorkeling, scuba diving, golf and plenty of sunshine. For more information on Loreto Bay homes, ranging from 1,090 to 3,109 square feet and priced from $375,000, and other Loreto Bay vacation opportunities call 1-866-956-7386 or go to: www.loretobay.com. At 7:19. President Felipe Calderón flew the National Flag in Constitution Square at half mast in memory of those that lost their lives during the earthquake on September 19 1985. 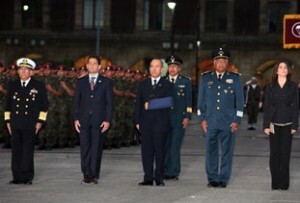 Flanked by Secretaries of the Interior, Juan Camilo Mouriño Terraza, National Defense, General Guillermo Galván Galván, the Navy, Admiral Mariano Francisco Saynez Mendoza, the President led the ceremony commemorating the 23rd anniversary of the earthquake that plunged Mexico into mourning. Other attendees included Head of the President’s Office, Patricia Flores Elizondo; General Coordinator of Civil Protection of the Interior Secretariat, Laura Gurza Jaida as well as President’s Chief of Staff, Javier Castillo Cabrera. Immediately after President Calderón raised the Monumental Flag as a sign of national mourning, a war band established a minute of silence and the ceremony ended with the National Anthem. At the end of the ceremony, President Felipe Calderón greeted the citizens who had attended the ceremony, including various members of Los Topos Group, who took part in the rescue work following the 1985 earthquake in Mexico City. New York, September 19TH, 2008 — The Mexico Tourism Board’s New York office celebrated Mexico’s Independence at Yankee Stadium Wednesday. Prior to the Yankees taking on the Chicago White Sox, Rubén Beltrán Guerrero, Mexico’s Consul General to New York, joined Mariana Pedrero, Director of the Mexico Tourism Board’s New York Office, to initiate the game with an acknowledgement ceremony. Alfredo Aceves who joined the Yankees this past August after playing in Mexico’s League, also joined them on the field and the MTB gave away more than 20,000 t-shirts in commemoration of their work with the New York team, which is currently finishing their last season at Yankees Stadium. The Mexico Tourism Board’s campaign at Yankee Stadium includes brand display behind home plate during the bottom of the third inning at home games and one on the bleachers that will remain until the closing of the stadium at the end of the season. On Monday, the Board started the “Let’s go to Mexico” Sweepstakes on the fans’ forum of www.yankees.com. Once visiting the Yankee website, click on the Mexico banner for sweepstakes entry information. Fans have until October 13, 2008 to enter their information for a chance to win a trip to the costal town of Puerto Vallarta. This contrasting city, the jewel of the state of Jalisco, has a colonial center with Spanish style buildings that are now art galleries and boutiques, a boardwalk, called el malecón, and many gourmet quality traditional restaurants. During the day, guests can go into the town’s jungles or take a boat ride to see dolphins and whales. And as the sun sets and shades of reds take over the sky, visitors usually head south of the center, where the city becomes a vibrant modern playground where every imaginable kind of fun is available. The winner of the sweepstakes will receive two round-trip tickets from New York City to Puerto Vallarta and a two-night stay at the sunny and private world of Unlimited-Luxury® world of Dreams Puerto Vallarta Resort & Spa. Mexico continues to be one of the top destinations for the US tourists. Last month, Mexico’s Minister of Tourism, Elizondo Torres, Secretary of Tourism, announced that 11.5 million foreign tourists arrived during the first six months of 2008, an increase of 4.6 percent from the same period of 2007. The minister added that the average expenditure of travelers during the first six months of this year was $800 dollars, a record for a semester. The MTB’s campaign at Yankee Stadium is part of a strategic plan that looks to attract specific people to Mexico and continue its growth as an international destination for Americans. At the beginning of the month it also paired up with Travelocity to facilitate travel plans on its website: www.visitmexico.com. According to a recent press release, Agavero Tequila is looking to change peoples’ minds with ‘Tequila Appreciation Days.’ If the mere mention of the word turns your stomach upside-down, you’re not alone. According to a recent survey conducted by Agavero and Ipsos of 1,200 men and women spirit drinkers, 38% said that they’ve had a bad experience when drinking tequila and nearly 10% said they don’t drink tequila anymore because of it. Moreover, only 7% of spirit drinkers felt tequila was a sophisticated or sipping spirit. again’ face when they merely hear the word tequila. that tequila is a drink that meets their sophisticated palate. — 82% said they would be willing to try tequila again if offered. Bottom Line, there are many great ways to enjoy tequila other than in a shot. and Agavero is the perfect spirit to begin to experience tequila in new ways. With the upcoming “Tequila Appreciation Days,” Agavero encourages you to let go of the past and give tequila another try. You will not be disappointed. Check www.Agavero.com often to find an upcoming “Tequila Appreciation Day” event near you. Personally, I like Agavero. It really tastes like a liqueur, rather than a hard Tequila. It’s an easy way back down the road, so you may want to give it a try. But, sip at your own risk! Agavero begins with a blend of select 100 % blue agave anejo and reposado tequilas, each aged separately in charred, white oak casks. The anejo tequila is aged up to eighteen months and the reposado tequila is rested for nearly a year. Then, the secret ingredient, the essence of natural Damiana, a flower native to the high altitudes of Mexico and known as an aphrodisiac, is hand blended to the tequila blend, creating a soothing combination of aromas transcended by a smooth, rich and flavorful character. This secret recipe dates back to 1857, when it was created by Lazaro Gallardo, founder of Los Camichines Distillery in Jalisco, Mexico. It has been passed down through generations and is still hand crafted today according to the meticulous production methods created by Master Gallardo. Westbridge Film School (WEFIS) announced today that it has discovered people from around different Latin American countries who have the potential of becoming successful movie actors, and that it has granted them a full scholarship to study its one year Acting for Film program. Mexico City, Mexico, -(PR.com)– WEFIS had issued a call last June, to discover talented people in Spanish speaking countries, and received more than two hundred applications from around the continent for the scholarship.“It wasn’t easy, we had to go through a very intensive selection process, but now that it’s over we are confident that the people we chose have all the potential to become professional movie actors and actresses”, said Mauricio De la Orta dean of Westbridge Film School in Mexico. The persons that were granted such an important opportunity are: Wendoly Rodríguez Corsino from Dominican Republic, as well as Aminta Paiz and Carol Stephanie Calderón from Guatemala. With this benefit, the people who got discovered by Westbridge Film School, not only will save a total of $5,500 US in tuition fees, but also will receive the opportunity to act in short films, acquire practical knowledge, and learn directly from film industry professionals. “We are investing a little over $15,000 dollars in scholarships to prove to the world that in the Spanish speaking population there is a lot of acting potential to be discovered, and that it can be found in Normal People. Now that we have discovered it, we are totally committed to developing it”, concluded Mauricio De la Orta. Westbridge University, an educational institution founded in 1999 that is focused in preparing successful professionals in creative fields such as Culinary Arts, Animation, Visual Effects, Film, Acting and Marketing.During its nine years of existence, Westbridge, the University of Creativity, has been able to position its graduates in the most recognized companies in the industry, both in Mexico and Worldwide. Westbridge University is recognized in the industry as a breeding ground for ethical creative-people, with practical skills, and who are in love with their profession. The below article is courtesy of Florelisa Hernandez of the restaurant Frascati in Riviera Nayarit. www.frascativallarta.comChiles en Nogada are, without a question, one of the most representative dishes of the Mexican Cuisine; popular tradition links them to an important event of Mexican history and they are also a delicious reminder of the colors of the Mexican flag. Popular tradition says that in August 1821, when Emperor Agustin de Iturbide signed the Cordoba Treaty (the document in which the Spanish Crown agreed to the Independence of New Spain (Mexico), on his way back to the capital, he stopped in Puebla to have a special celebration of his “Santo”, (the celebration of the saint that shares the name of the person, in this case St. Agustin). In Puebla the Augustinian nuns (very famous for their culinary abilities) prepared a very special dish for the happy occasion, Chiles en Nogada. Since then, the dish is linked to Puebla, to the rainy season and the Independence of Mexico. It is well known that the ingredients, found in the poblano region, (like pecans from Calpan, apples from Zacatlan, pear and apricot from Huejotzingo, pomegranate from Tehuacan, and poblano chili from San Martin Texmelucan), are at their best during the months of august and September. The name means Chile topped with pecan sauce (Nogada).The dish is a class of stuffed chile, made of green poblano chili stuffed with cooked ground meat, seeds and dried and fresh fruit. It is served cold and topped with a slightly sweet pecan sauce, the decoration is made of pomegranate and parsley leaves it has a sweet and sour taste and it is not hot at all. As a token of gratitude to Mexican hospitality, Frascati Ristorante pays homage to the best of the culinary traditions of Mexico, and wants to share them with you.